Cardiff Bay train station is located two minutes away. At end of the Cold War, most states under communist rule shed their Marxist principles and scrambled to join a new international order. Some did not. In several nations across the globe, the Communist Party has managed to hold on, mutate and adapt to the 21st century. From favouring revolution, the party has recently won two elections. It has turned some countries into isolated military complexes, and others have embraced private property and liberal economics. Whether due to unaddressed class inequality, nostalgia or the steel fist of totalitarianism, these places continue to resist against the tides of history. Over the course of seven years, Tomas van Houtryve secured unprecedented access to North Korea, Cuba, China, Nepal, Vietnam, Laos and Moldova . Behind the Curtains explores the gulf between the high ideals of communism and its complex present day reality, revealing a secretive world of spies, revolutionaries, opposition fighters and ordinary factory workers. 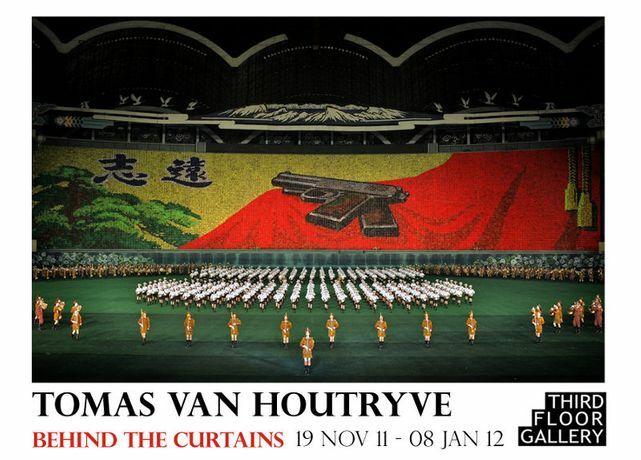 Tomas van Houtryve is a documentary photographer with the VII Photo agency. He is the recipient of numerous prestigious awards including POYi Photographer of the Year, the Bayeux Prize for War Correspondents and the Perpignan Young Photographer Award. The opening of the exhibition will feature real ales by Otley Brewing Company and the exhibition has been produced with the support of Davies Colour.